Finding Your Voice: Who Are You on Social Media? 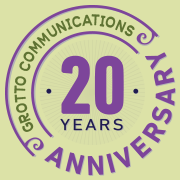 | Grotto Communications Inc.
You’re starting to get the hang of it. Posting updates on Facebook, creating a page for your business and maybe dipping into the river of noise that is Twitter. But how are other people “hearing” your voice? Do you come off like a knowledgeable and engaging business person? A super chatty wanna-be celebrity? A vague, disconnected cipher? Honing your “voice” means fine-tuning what topics you engage in, what kind of words you use and even the frequency of your communications. Every aspect of these virtual declarations and interactions is standing in for a lot more content than meets the eye. What Topics Do You Engage In? Depending on what type of business you do and what your goals are for social media, the topics you choose to talk about may need to be refined. Do you promote your company all the time? It’s always better to offer ideas and connection beyond those which would directly benefit you. This is not the place for “sell, sell, sell”. Or do you post and chat about absolutely every tidbit that even vaguely appeals to you? If so, friends and followers may have trouble remembering in which areas you actually excel. Showing authentic personal tastes definitely fosters rapport. But spouting off on political rants — unless you swim in those waters for a living — or reporting every meal you eat — unless you cook for a living — isn’t the way to convince people that you are a crackerjack business pro. Keep coming back to home base: news, tips and conversation starters that easily connect with your mission. Ask questions. Tell an occasional (usually squeaky clean) joke. Show people what it’s like to do business with the real you. Grown-ups running businesses should be judicious with how they use slang and abbreviations. Shortening words is critical in Twitter and texting, but if your messages wreak of teenybopper (“OMG, R U OK?“), you risk losing respect . Succinct is good; humor is helpful. Try to tap into how you really talk when you are most on your game. Confident and compelling. Stay positive. And take it easy with the jargon. The more you know about who is following you, the better you can gauge how much industry lingo they can translate. Goldilocks has the right idea: not too much, not too little. Obviously, posting constant updates on your every move (now even literally with location apps) can put off many friends and followers. And piping in after days or weeks of silence doesn’t give others a reason to think you’ve got much useful to share. Aim for just right. Experiment and set some objectives to see if certain updates seem to attract more attention (i.e., retweets and replies in Twitter, likes and comments on Facebook, discussion on LinkedIn). Set aside some time to note interesting trends or follow some RSS feeds that will give you news that might be useful to share. Don’t forget to link to your own web site or blog every so often since newer followers may need a reminder. If you think you’re a great gal or guy to work with (and why wouldn’t you!? ), there’s no reason why you can’t channel some of that charm and know-how into your virtual voice. Please tell me I’m doing that with my facebook page!! If not, I’m truly not getting it…. Dr. Joy, your Joyful Dental Care posts on Facebook are a great example of setting the right tone, right topics, regular posting (without massively posting). Even your dental jokes are on point. Definitely shows personality while staying professional.